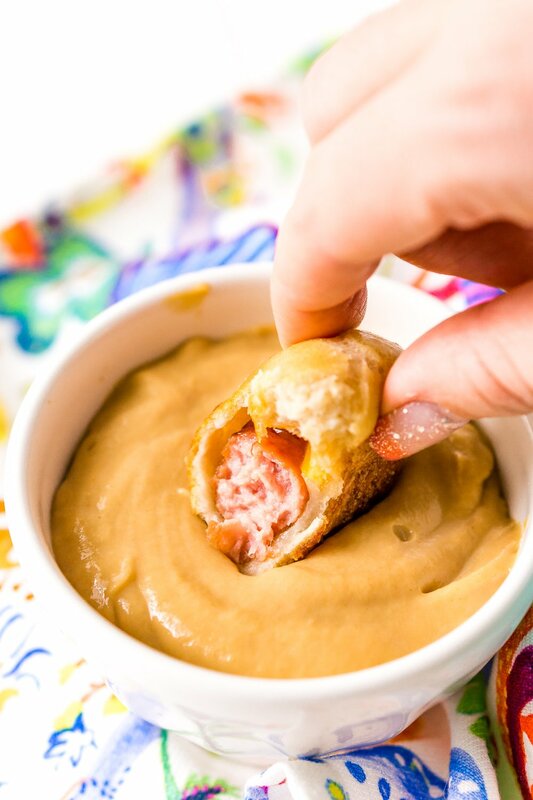 These Pretzel Pigs In A Blanket take two of your favorite party foods and combine them into one! 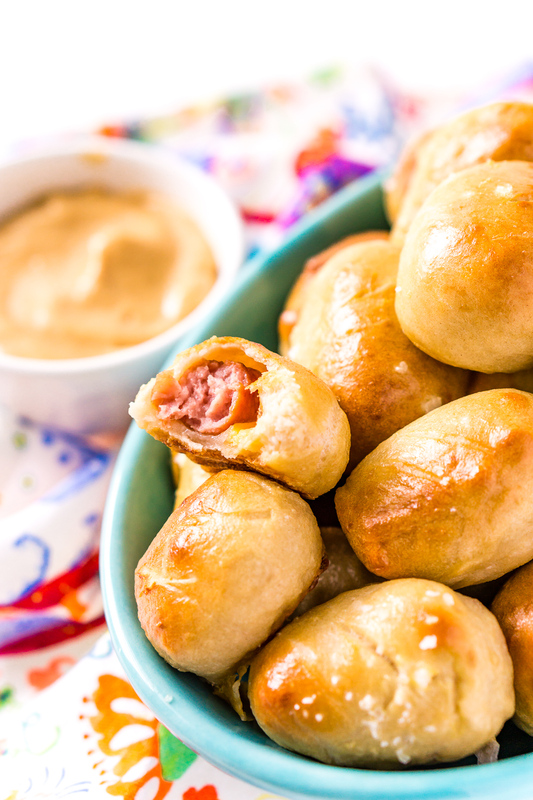 Mini sausages and cheddar cheese wrapped in dough and baked to perfection! 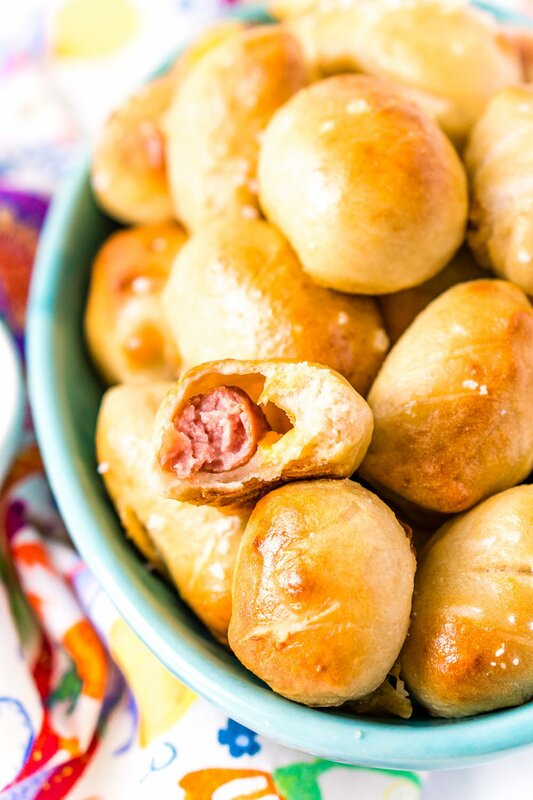 If you love little smokies and soft pretzels, these Pretzel Pigs In A Blanket will be your new favorite snack! 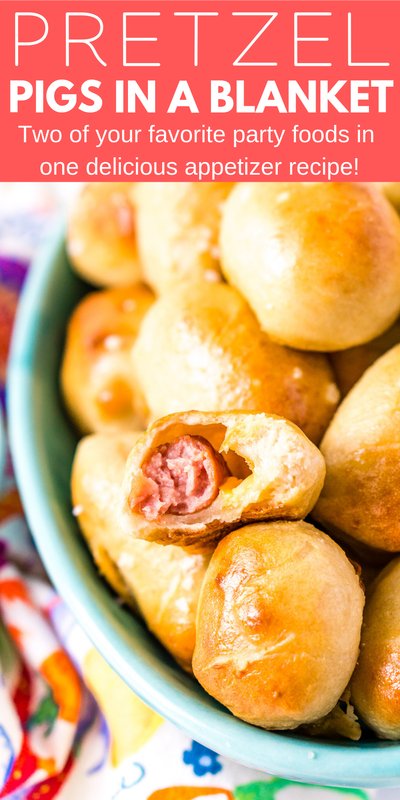 Perfect for parties, after-school snacks, and game days, this classic recipe is like Pigs In A Blanket with a twist! 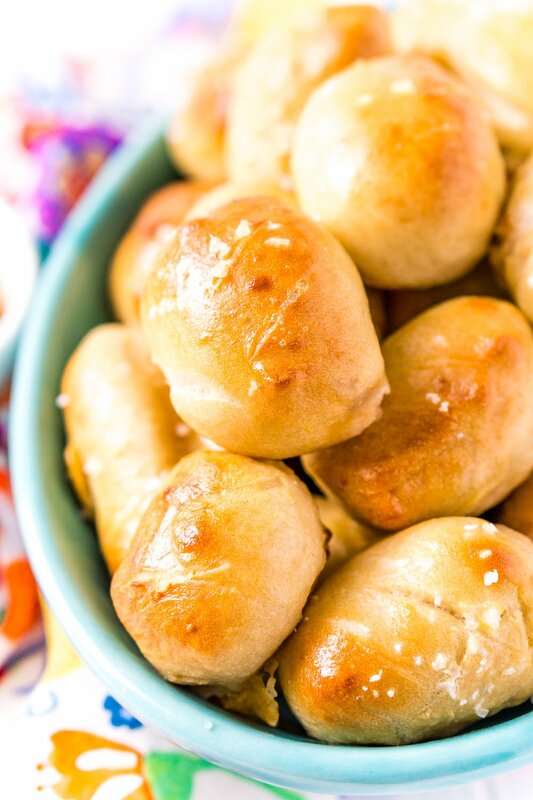 Tender mini hot dogs wrapped in soft pretzel “blankets” and topped with a sprinkle of course sea salt … so yummy! Serve these tasty two-biters with a drizzle of mustard or ramekins of condiments for dipping. 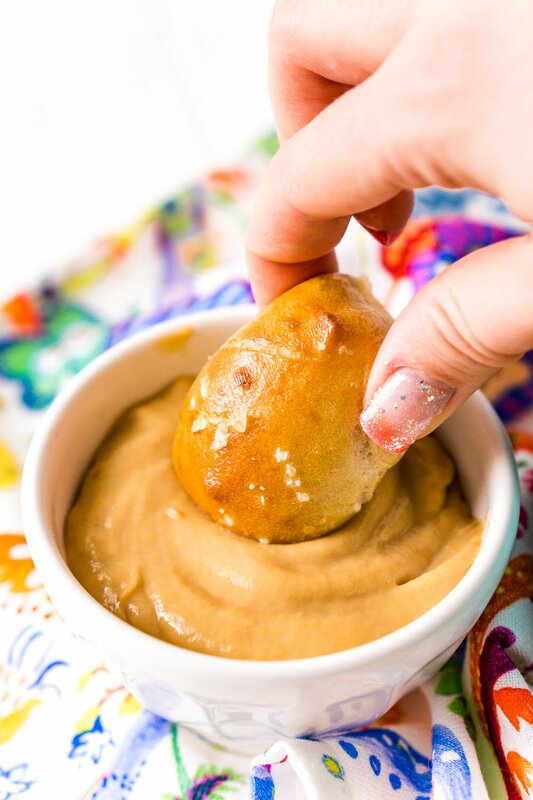 Personally, my favorite sauce to serve and enjoy these with is my sweet and savory Maple Mustard Sauce! In any case, they’ll be a hit! Luckily, these snacks are as easy to make as they are delicious. First, wrap little smokies in cheese, then roll them in pieces of pizza dough. Then, boil them for 20 seconds in water and baking soda. I know, that last step sounds weird … but it’s what makes the crust look and taste like a pretzel. You learn something new every day, amirite? Last, each bite is transferred onto a baking sheet, then brushed with egg wash. The last step is to sprinkle them with coarse sea salt, then bake! Can I Make Pigs In A Blanket Ahead Of Time? Yes! believe it or not, these bite-sized appetizers reheat really well! Even a couple of days later! Just warm them up on a baking sheet for 10 to 15 minutes at 350 degrees F. Make sure they’re heated through before serving! There’s really no wrong occasion to make these scrumptious morsels, but they’re a perfect app to serve at casual get-togethers. People love grabbing a few of these snacks at potlucks or backyard barbecues. They also make awesome after-school snacks for kids, especially if you have teens with big appetites. When their friends come over, make a few batches of these, you’ll be Mom or Dad of the year. The other occasion these munchies are great for is GAME DAY! Whether you’re hosting a big football party or heading to someone else’s house, bring a platter of these with you. 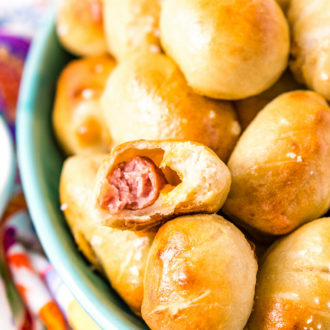 If you live in a sport-centric city, you need Pretzel Pigs In A Blanket at your tailgating party. Or maybe your kid does sports and you get hungry on the sidelines … yep, these snacks are good for that, too. 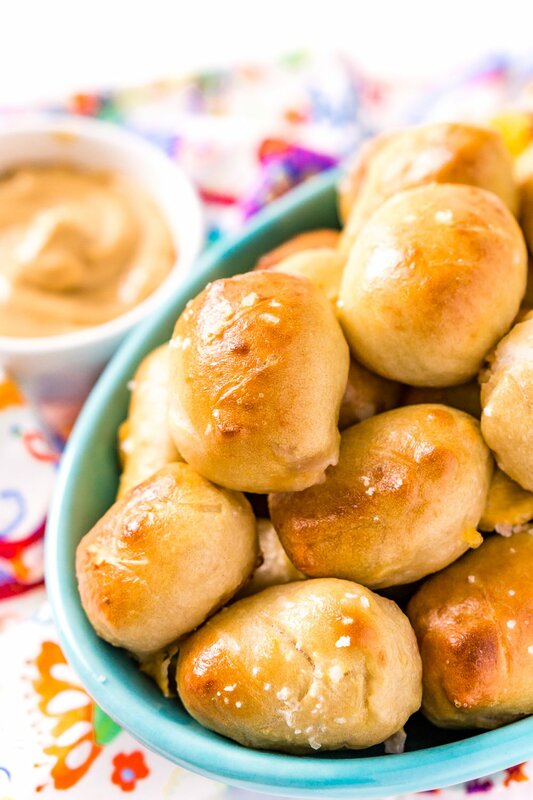 In any case, you really can’t go wrong with these crowd-pleasing Pretzel Pigs In A Blanket. My biggest word of advice: wherever you go, make sure to bring enough to share! Cut the cheese into 36 small square pieces and set aside. Cut the pizza dough into 36 evenly sized pieces. Flatten the dough pieces of dough and place a piece of the cheese and a sausage in each one and wrap the dough around them pinch to seal the dough tightly. Preheat the oven to 450 degrees F and line a large baking sheet with parchment paper and set aside. Fill a large pot with the 10 cups of water, add in the baking soda and bring to a simmer. Work in batches and drop the dough wrapped sausages into the water 6 at a time and cook for 20 to 25 seconds. Use a slotted spoon to remove the pigs in a blanket from the water and transfer to a paper towel-lined plate. Repeat until all of them have been done. Transfer the pigs in a blanket to the prepared baking sheet and use a paring knife to make a shallow cut across the center of each one, DO NOT cut all the way through. In a small bowl, gently beat together the egg and tablespoon of water, then brush each pig in a blanket with the egg wash and sprinkle with coarse salt. Bake for 10 to 12 minutes until the pigs in a blanket are golden brown. Enjoy with Maple Mustard Sauce or dipping sauce of your choice. Recipe slightly adapted from Fresh magazine.